What is, to my mind, the finest Dido and Aeneas recording currently available features an American cast and orchestra. The 1993 Harmonia Mundi recording with the late mezzo-soprano Lorranie Hunt Lieberson in the title role has it all. For sheer gorgeous vocalism wed to dramatic intensity, Lieberson is unsurpassed. Her every phrase and gesture carries weight. Lieberson's singing of the lament? I had to sit in silence afterward and collect myself... This recording, with [Nicholas] McGegan leading a remarkably responsive Philharmonia Baroque Orchestra, cuts to the heart of the work. The Dido and Aeneas (sung by baritone Michael Dean) exchange in Act III seethes, and Lieberson's cry of 'By all that's good!' is shattering. For once, the roles of the Sorceress (mezzo-soprano Ellen Rabiner) and the Witches (sopranos Christine Brandes and Ruth Rainero) are colorful but not so broad as to descend into Monty Python parody." "McGegan and the orchestra are buoyed, not bowed down, by their specialist knowledge, and undaunted by the technical difficulties of some of the older instruments. They master intricate rhythmic and phrasing details that you don’t normally hear from modern instrument orchestras, yet play them with a conviction and ease that sounds natural. McGegan’s adrenaline-filled gestures transmit his excitement, and the orchestra normally responds by lifting you out of your seat. This is music-making by people who have been to the early-music revolution and come back enriched." Read more of Michael Zwiebach's preview. Click to listen to the audio preview with Nic and Chorale Director Bruce Lamott and stings musician Maria Caswell. 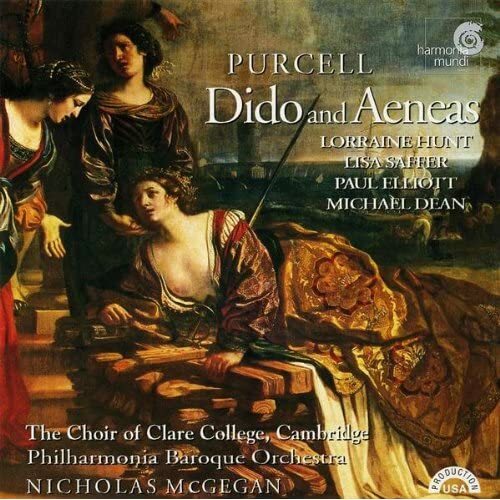 You can also listen to selections from our recording of Dido and Aeneas on November's concert page. Hint: when you click on "Learn more about these recordings," you can read about these works!